...but I have been helping someone I love fight it for the last five years. And I have become increasingly interested in nutrition and the role it plays in making your patient feel better, and even help them cure their disease. I decided to start this blog, not for the cancer patient (although some of you reading this may be cancer patients, and I do welcome you here, believe me! ), but for the cancer caretaker. You, the caretaker, are devoting your time, energy, and love to someone fighting cancer. I know how it is. You are desperate for ideas that will work. Food they might eat. And probably a little nourishment yourself. There are hundreds of amazing books out there, and experts in the field, and I hope to direct you to some of them who have helped my family. Sharing knowledge is a wonderful thing. Food is incredible. Food is healing, it is medicine, it is comfort. I grew up with my mom's delicious homemade yogurt, fresh fruit, and whole wheat bread. But even with such healthy foods, you may have to change your diet to be eating the best foods to fight cancer. My beloved cancer-fighter likes to say, "Christy, I have been eating this way my whole life. I can't change my diet overnight," and there is great wisdom in that. Some people can cut all animal products, sugar, and processed foods from their diets and go on a raw foods diet, but that isn't always easy to do. You can take the changes slowly. We try a healthy snack or two one day, a healthy breakfast the next. We try to cut refined sugar out of our diet as much as possible. We started with smoothies that had whey protein powder, flaxseed oil, tons of fruit, yogurt for protein. But there was often an ingredient that didn't sit right. Now we do smoothies with fewer ingredients, but powerful ones. 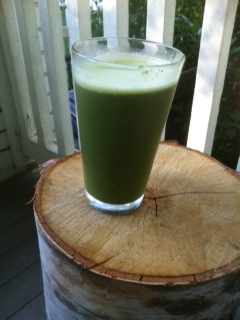 Today's recipe (and many day's): Green Smoothie. Kale is a wonder food. Dark leafy greens are the most missing ingredient from our diet. They are rich in iron, calcium, fiber, folic acid, zinc, magnesium, chlorophyll, and vitamins A, C and E. If you can get 2 pieces of kale in a smoothie, you are golden. They even give you protein, and enhance your mood! If your patient (or you!) is hungry, instead of grabbing for a bag of chips, try this instead--you will truly feel better. After blending for a long time, add a couple pieces of ice to keep it nice & cool, and puree for a moment more. Enjoy! I can't wait to try that recipe - for myself, my family, and my 2 loved-ones with cancer. I love the catbird. It pierces my heart - beautiful, as is your testimony!